There are a fair number of places I have visited in my adult life, and with the exception of Antarctica, I have been to every continent. Of the places I have visited, there are few that give me this feeling of comfort and strangeness at the same time as Tokyo. The strangeness for a European is immediately clear and it is intimidating and liberating at the same time. Intimidating, because one always fears to be making a big faux pas in the next moment and not knowing why. It is liberating, because – at least from the outside, Japanese seem to be very forgiving for the strange behaviour we non-Japanese show. This is particularly true if you genuinely try to follow at least basic good behaviour and convey a certain modesty and courtesy. The knowledge that you will make mistakes anyway will give you a certain freedom, similarly to the odd relative whose behaviour everyone excepts even though it breaks social norm and convention. Getting the chance to go to Japan is something I will always jump on and will always give me this feeling of wanderlust. Of course Tokyo is packed with places with a view. 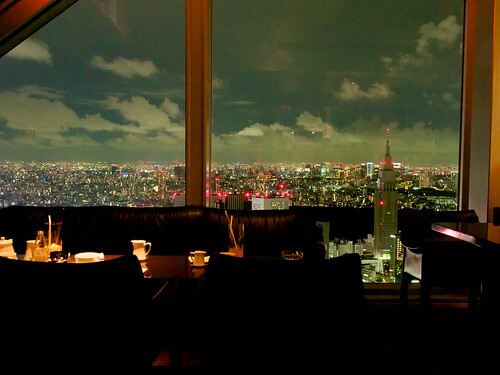 But the one place which I want to highlight is the hotel bar of the Park Hyatt in Tokyo. It is of course the bar famously featured in the film “Lost in Translation” starring Scarlett Johansen and Bill Murray. I visited the place last September during a short trip to Japan. And while it is now probably a rather touristy place to visit, the bar has a fantastic atmosphere and the view, particularly in the evening, with all the lights and the skyline of Shinjuku is something which I will always remember. The photo on the top was taken in this bar and while the picture is a mere snapshot, full of imperfections due to the reflections from the lights in window, the greenish colour cast from the tungsten lights, I hope it still transports a bit the fascination for the Japanese capital with all the extremes it exhibits. It’s an interesting choice for your wanderlust–such an exotic place! Places change with the times but it’s always nice to have a photo in order to relive those special moments. Thanks for sharing this. I really like the picture and the way you wrote up your experience!